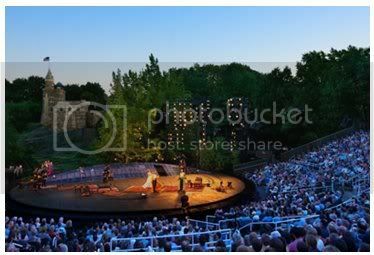 Top Ten Tuesday: Dare We Dream of Delacorte? For thy complexion shifts to strange effects, After the moon. Thou bear'st thy heavy riches but a journey, And death unloads thee. In January, I write a post about Liev participating in a New Yorker Festival panel on Young Shakespeareans, in which Liev says that he would like to work on a production of Measure for Measure. HERE. Later on, choosing to be optimistic about said project, I elaborate on a little M4M for the Layperson, HERE. On Sunday, Liev is quoted in an article as saying that he might do Shakespeare in the Park this summer. HERE. Last night The Public Theatre website is updated with some details on two Shakespeare productions for their Summer Season at the Delactorte. One of them is Measure for Measure. HERE. In the hopes that Liev will fulfill his M4M wish and be on that stage this summer, I dug up this audio interview with Himself and the American Theatre Wing. Liev shares his feelings about what a unique experience it is for an actor to perform at the Delacorte. - "It is as far as I'm concerned the greatest theatre space in the world." - "I really love it." - "You have the huge advantage of... it's just the most exquisite place to sit on a summer night." - "People are very happy to be there." - "It's an incredible tradition; it's an incredible gift from New York to itself." - "That good will that comes with the space goes a long way." - "It's a tough space, the physicality of it. I start working out about five weeks before just to get in shape." - "What I love about the Delacorte Audience is they're a little bit rowdy." - "Rain was coming down and we were all tired but the audience kept stomping their feet, wanting us to go on." - "Film is a completely different animal than Theatre... gives you that chance to build a relationship with an audience like this."